Contrary to popular belief, children can get cavities. 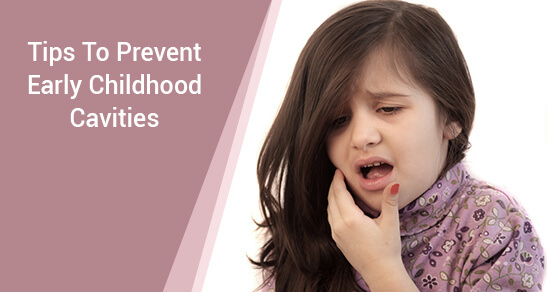 Children’s teeth are susceptible to a condition called early childhood caries. Early childhood caries, also known as early childhood tooth decay, are a form of cavities that usually affect the upper front teeth in children. These caries present themselves as white spots near the gum line before progressing into brown spots. If caught in time, caries will not grow into full-fledged cavities. What causes caries in children? Most of the liquids we feed our children contain sugar (milk, juice). After a feeding, if these liquids remain in your child’s mouth for long periods of time, bacteria can form on their teeth. This bacteria uses the sugar to create acids that wreak havoc on young teeth and lead to their destruction. Besides the liquids our children consume, poor oral hygiene, frequency of feedings and certain medications can cause caries. Although your child’s mouth is susceptible to caries, there are 10 ways you can help prevent them. Although it may seem like a no-brainer for adults, children need help brushing their teeth. You should brush your child’s teeth twice daily for two minutes each time. You can make it a game if that’s the only way to get your child to stay still while you clean their teeth. Children under two only require a tiny amount of toothpaste, while older kids need only a pea-sized amount. Use only soft toothbrushes that are designed for little mouths. For children who do have teeth yet, you can gently clean your baby’s gums with a soft cloth and water. Do not dip pacifiers in sweeteners of any kind. Some parents will dip pacifiers in honey to soothe crying children – but as previously mentioned, bacteria love sugary substances and this leads to tooth decay. Water is the best option for thirsty children. If you are going to give your child juice, do so sparingly. For example, if your child requests juice, only serve it along with a healthy meal. Make sure to only give them half a cup and do not give them juice before bed. You should avoid giving your child soda or other carbonated beverages altogether. The sugar content in those drinks is above average and your child’s teeth cannot handle it. Schedule your child’s first dentist appointment as early as six months. Then, follow up with regular visits as you would do for yourself. Your dentist can refer you to a pediatric dentist or they can treat your child’s teeth if they offer dentistry for children at their clinic. Ensure your child eats a balanced diet even if they have not graduated to solid foods yet. You can read the ingredients on pre-packaged baby food and look for brands that are low in sugar. If you have the time and a blender, you can also make your child’s food by pureeing fruits and vegetables. Rinse your child’s mouth after each feeding or meal. Use water to gently remove the food debris or liquids left over from the bottle. Do not use the mouthwash you use because it is not made for young mouths. There are mouthwashes available for kids but ask your dentist to recommend a brand they trust. The earlier you teach your child to drink from a cup, the better it is for their teeth. Bottles cause the liquid to pool around the front teeth, making them more susceptible to caries. If possible, show your child how to drink from a cup before their first birthday. According to the American Academy of Pediatrics, children who continue to use a bottle after 15 months have a higher risk of getting caries. Skip dessert. Many parents let their children have sweets after dinner but this is a big no-no. Instead, keep your child’s junk food consumption to the absolute minimum. For instance, let them have a small piece of cake at a birthday party, but don’t let them have sweets daily. If your child falls asleep during a feeding, remove the bottle from their mouth immediately so that milk doesn’t have a chance to pool around their teeth. Ask your dentist about sealants for your child’s teeth. Sealants are clear plastic coverings that are applied to the chewing surfaces of the teeth to create a barrier that keeps food from getting caught in the natural groves of each tooth. At the first signs of caries, contact your dentist right away. With proper treatment, caries will not progress into cavities. Please contact Dawson Dental for more information. We offer pediatric dentistry and can ensure that your child has a happy and healthy mouth for years to come.